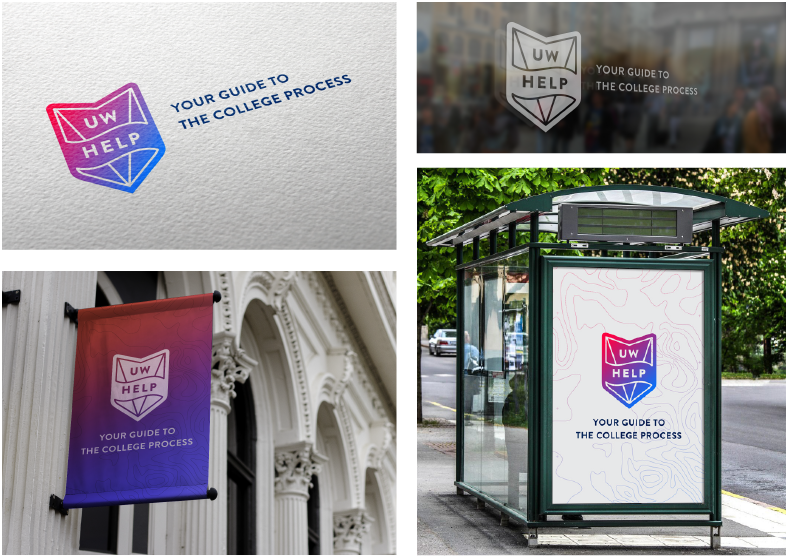 The UW HELP identity is the face of our brand. It is how we communicate our brand and represents our core values and offerings. It is what makes UW HELP recognizable wherever people may encounter it. The brand identity includes the logo, color palette, typography, and other supporting visual expressions. This document outlines each of these elements and how they can be used to visually bring the brand to life. The UW HELP logo is a visual metaphor for our core brand values and offerings. It represents optimism, strength, support, and a beacon for the journey through the college process. It is our primary symbol and signals who we are and what we stand for. There are three variations of the logo; pin only, horizontal with tagline, and vertical with tagline. When using the pin only version, feel free to explore cropping, color, scale, transparency, and filling the pin with photography or pattern. Examples of this type of use can be seen further down this page. Logo variations with the tagline should be used in applications that best suit their orientation and allow for the required clear space outlined within the logo usage guidelines. 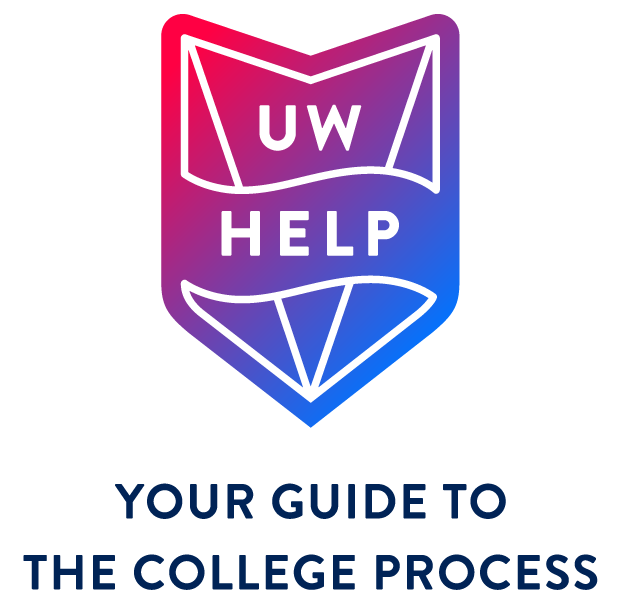 Alternative use of the UW HELP logo is provided below for positioning and the logomark. We have added standards for the logo when it drops below the required sizes for use on materials such as pens and other promotional products. Other logos used as part of the UW HELP brand such as the UW Journey and MajorMania logos are provided for download below. Regardless of the medium or the message when our logo is featured with the tagline, it must always be clearly legible and free of visual clutter. Clear space and minimum size standards HELP to ensure that our mark is given the prominence it deserves and ensures consistency. The height of the pin is used as the ruler for relative vertical & horizontal clear space required around the logo. 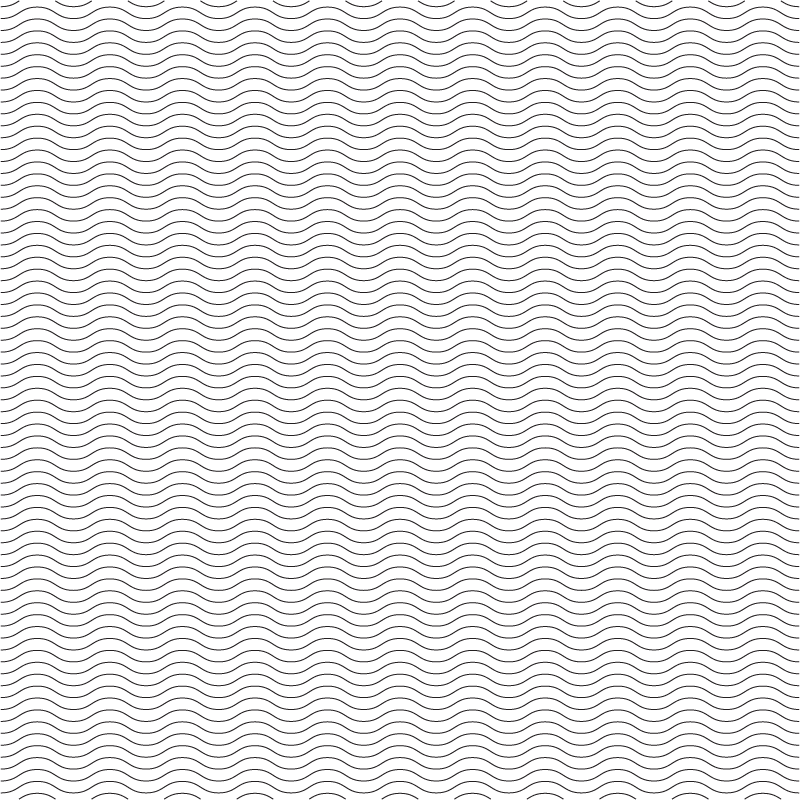 The same ruler applies to the vertical variation of the logo. Clear space guidelines should not limit play and experimentation with the pin only version of the logo. Minimum size refers to the smallest allowable size of the logo. It may be scaled down to a minimum size of .5 inches tall for print applications and 36 pixels tall for digital. There is no maximum size for the logo. 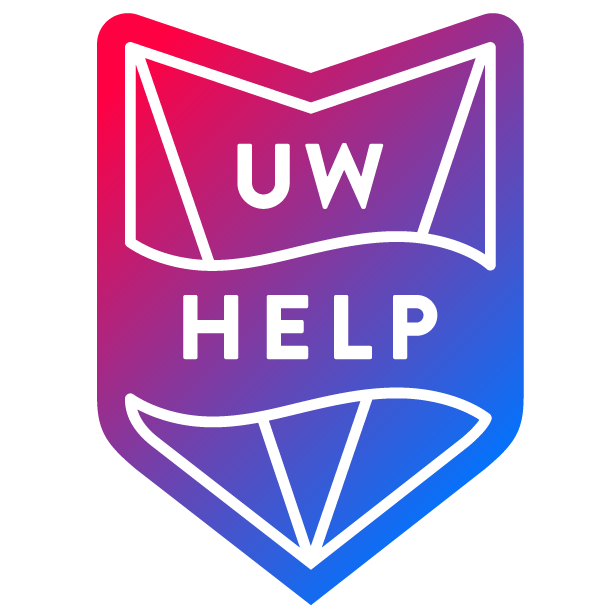 For all executions, the UW HELP logo must be at least equal to (if not larger than) any other logos (3rd party, other brands, etc.) 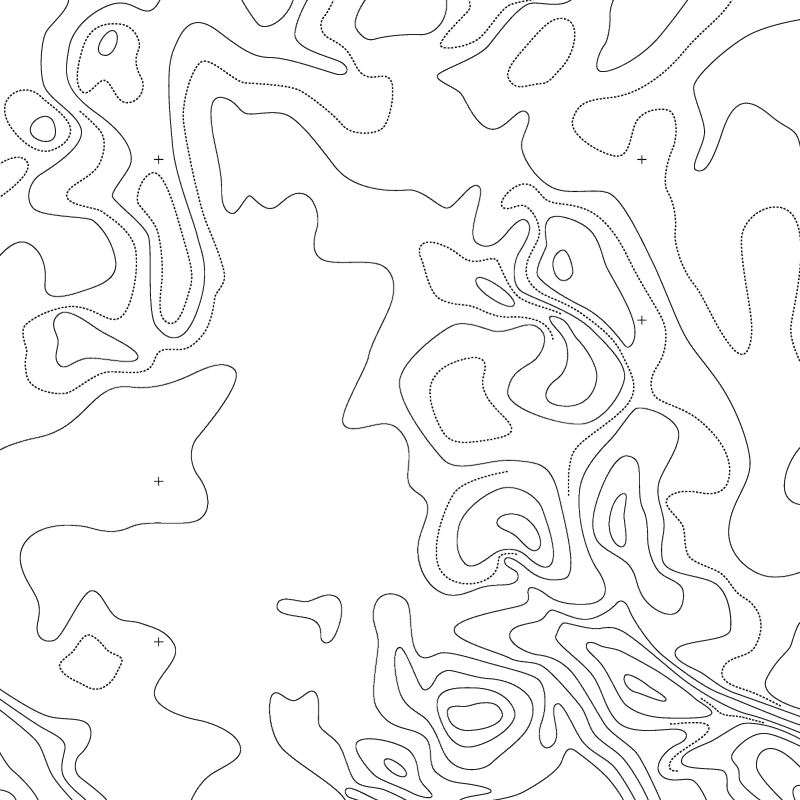 appearing in the same layout. proportions and spacing relationships of this lockup never change. Never scale the pin or tagline separately and always maintain the logos original aspect ratio. 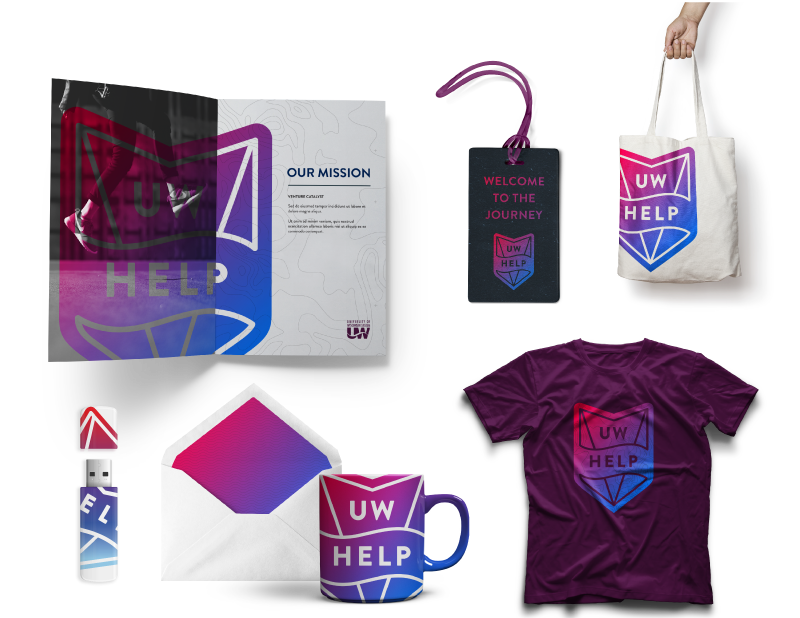 Our color palette reflects UW HELP’s personality and tone of friendly, vibrant, and optimistic, yet sophisticated. Over time, the consistent and prominent use of these colors builds brand recognition and helps to distinguish us among the academic landscape. The color palette is made up of darks, brights and neutrals. Darks are colors we share with the UW System pallet to keep us connected to our roots. Brights are a more saturated derivative of darks and bring more contrast and vibrancy to the brand. Neutrals are variations of grey to give our pallet depth and keep the spectrum versatile. 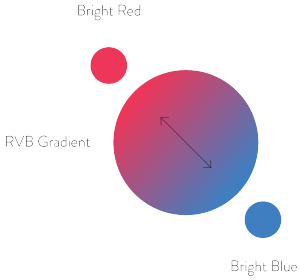 UW HELP also owns the Red Violet Blue (RVB) gradient which is created by connecting red and blue from the brights palette. The gradient should be reserved for one element in a design piece and not over used. Use the appropriate values for the correct application. Always rely on the Pantone Matching System® guides for color matching when printing. as colors will vary depending on the printer and paper. and bright blue to create a vibrant gradient or glow. corner at a 45 degree angle. Primary color palette for UW HELP. Brandon Grotesque is the UW HELP primary typeface. It should be used whenever possible on all branded materials. It’s shape and design is a derivative of Futura, the UW System typeface, with slightly rounded corners which feel approachable and friendly yet sophisticated. A license is required to use Brandon Grotesque. The current license allows for use in all print, digital, and on-screen applications. You may not share the font with third parties for use other than UW HELP brand materials. If there is a need for use not listed above, please reach out for more details, or to purchase an extended license. If you absolutely can not gain access to Brandon Grotesque, please first seek to use Futura. If you do not have access to Futura use Verdana (Regular and Bold) as a last resort. Verdana is a system font that is available on all PC and Mac systems and web safe. 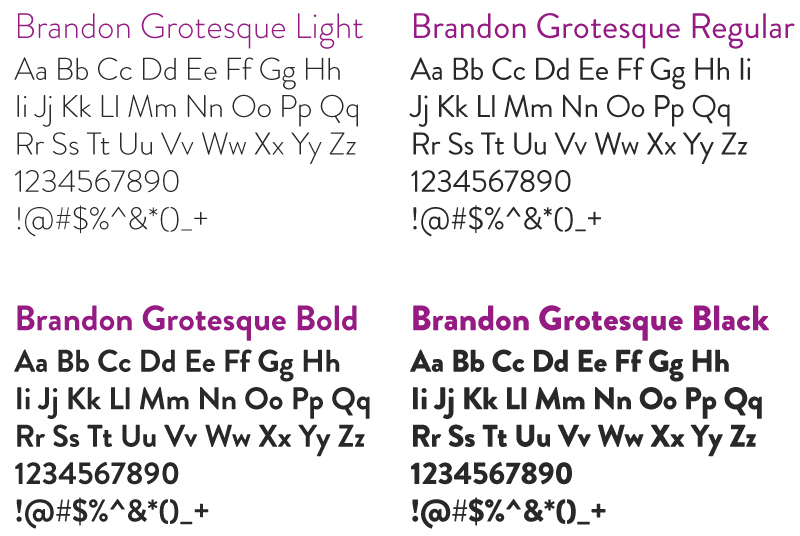 When possible, online applications should use a font replacement technique that allows Brandon Grotesque to be displayed as a web font. Verdana should be used for web materials only when a font replacement technique is absolutely not possible. in the context of a sentence. 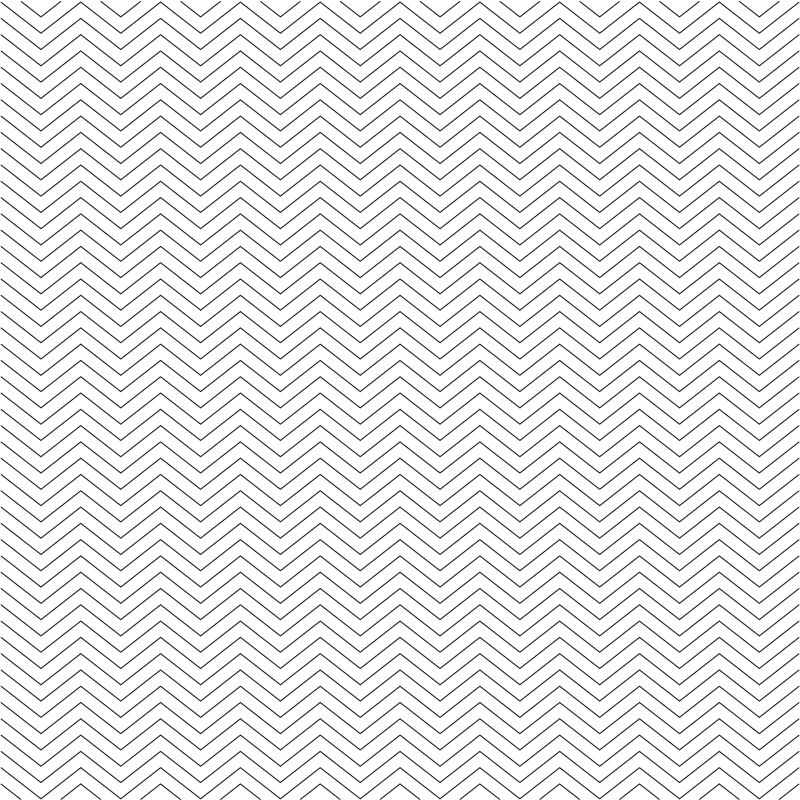 Leading is the space between lines of type. When type is below 16pt., leading should be 6 points greater than the type size. 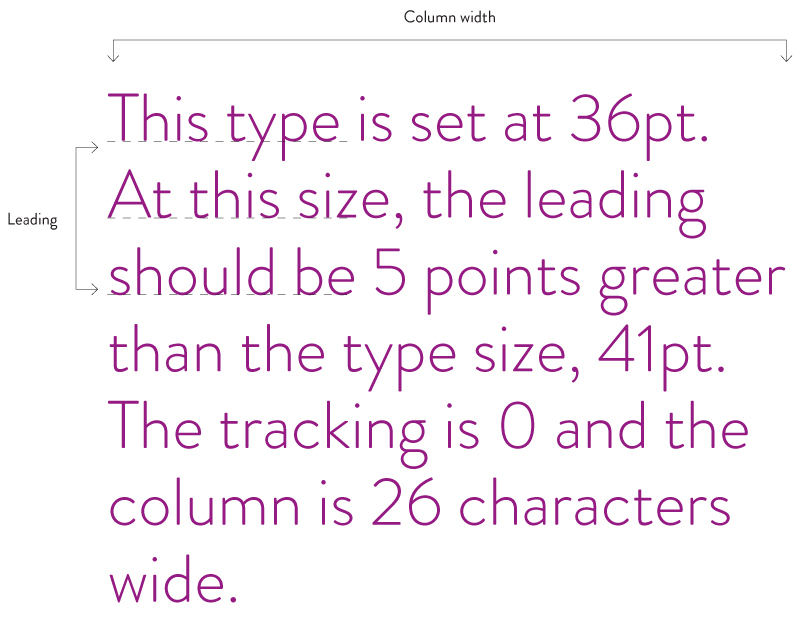 Above 16pt., leading should be 5 points greater than the type size. Tracking is the space between letters. Never set type with less than 0 tracking. Letters should never touch each other. 70 characters or less than 20 should be avoided. 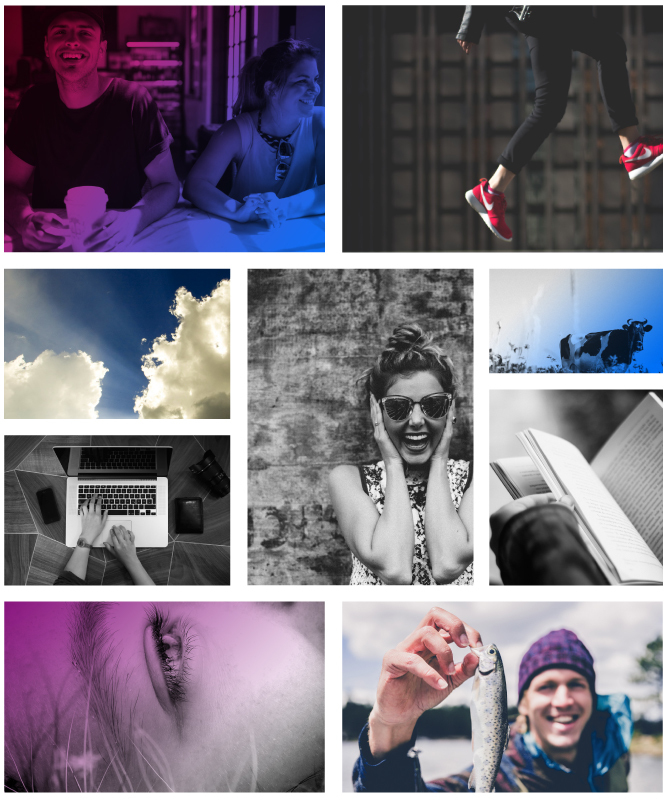 Photography focuses on people and their point of view and celebrates them as the hero of the stories. 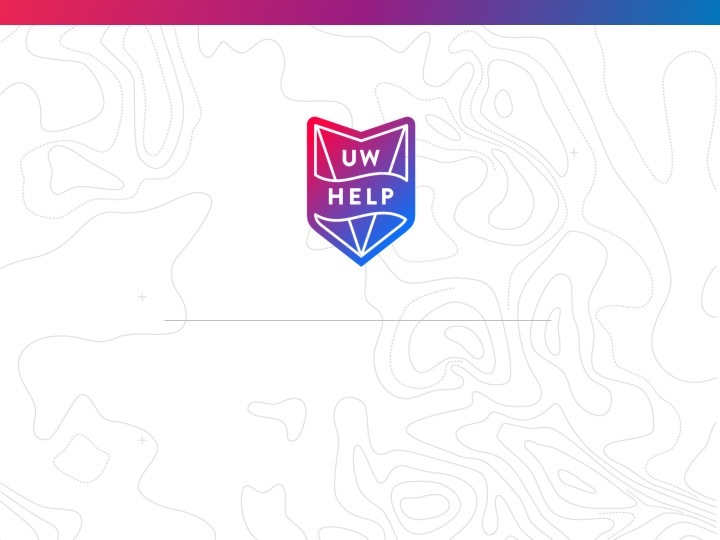 Iconography and UI elements are simple and streamlined to align with the line weight within the UW HELP logo. They should be represented in solid flat colors, not gradients. 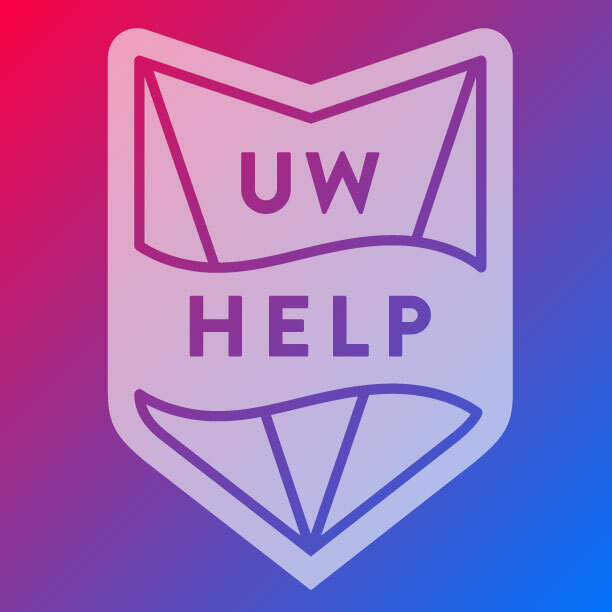 The linework patterns and texture below are derived from the UW Help logo and may be used as a secondary graphic element. The UW HELP presentation theme is available in two sizes: the traditional 4:3 format, and the modern 16:9 format. It is important to know ahead of time how the final presentation will be displayed. Widescreen formats such as 16×9 are becoming more popular for projectors, TVs, and computer monitors, but it is best to know for certain what type of screen will be used. The slides will appear with black bars on the top and bottom or the sides if the aspect ratio of the presentation differs from that of the screen on which it is presented. department for additional files. If you have any questions about these guidelines please contact Nichole Knutson from UW HELP. 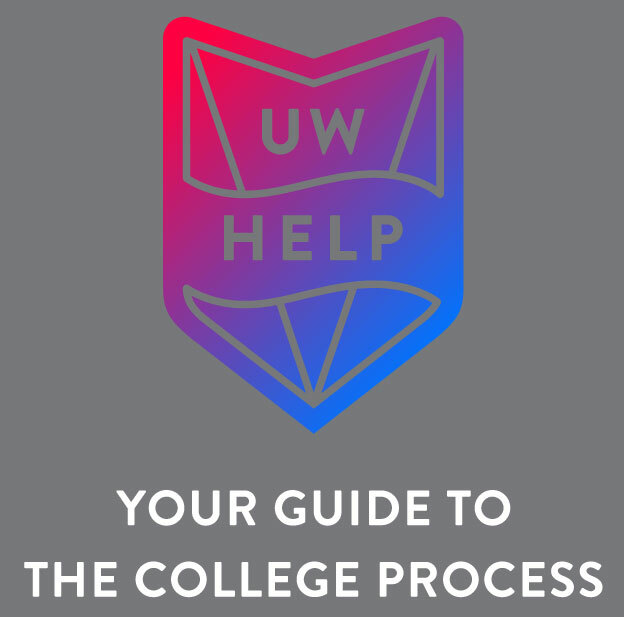 Download the UW HELP brand standards pdf.